Time line - Extracts taken from newsbriefs. August 2014. • Progress continues on the new diesel loco. The tanks to contain the hydraulic oil for the motor and pumps have been designed, laser cut and welded up. 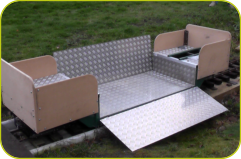 A manual braking system has been designed and manufactured which will overcome a potential running away problem “down the hill”. March 2014. • The problem with the failing seals on our new diesel loco hydraulic pump has now been rectified. 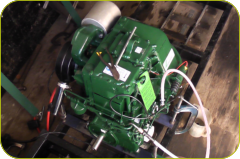 So we now have a pump/engine combination that has been proven to develop the power required for our new loco. 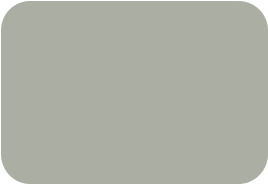 The hydraulic oil tank design is ongoing, this is not as easy as it might sound as the quantity of oil involved is considerable and the size of our loco is finite. December 2013. • Problems with the new diesel loco have came to light that the diesel engine is only generating around 250 p.s.i and is only delivering around 5.3 h.p. and that a new engine was required. We have now taken delivery of a totally rebuilt twin cylinder diesel engine ,which is rated at 20 h.p., as a replacement. August 2013. • The new diesel loco has made rapid advances. The two Co-Co bogies are now completed and painted. We had all the platework laser cut and in the main they are of bolted construction. The loco frame is also complete and painted. March 2013. • Significant progress has been made on the new Co Co Diesel. The bogie design was completed towards the end of February, various plates for the bogies are being laser cut, various sprockets have been purchased and bearings, seals and other items are on order. December 2012. • There has been very little progress on the new diesel loco. Hopefully a start will be made actually cutting metal in the near future. • Any further work on the “Maid of Kent” in abeyance pending decision on its boiler. August 2012. 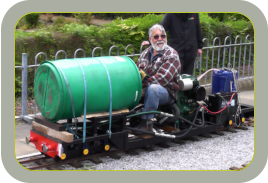 • The Society's Wren was finally completed late May and given its steam test and first run only three days before the Rotherham Street Party which was held on the 2nd. June. 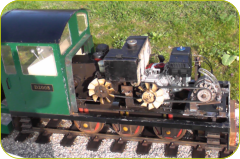 • There is some progress to report in respect of our new diesel loco, with the fitting of a new coupling to go between the engine and hydraulic pump. March 2012. • Work continues on the reboilering and rebuilding of the club loco "Wren", with new cleading complete. • There has been some progress in respect of the new diesel loco. The Society has now purchased two new hydraulic motors that should be capable of running at 600 rpm. to give us a maximum speed of 10 mph. • We took the decision to purchase a new petrol engine of higher power - 6.5 hp compared to 4.5 hp - and this has now been installed. • There is no progress to report on the "Maid of Kent" rebuild project due to other priorities. December 2011. • The Wren new copper boiler has now been mounted, along with the water tank, and new boiler fittings. New iron piston rings have been manufactured and the cylinders have been refitted. The wheels, axle boxes, springs, smoke box and chimney have been fitted. • Some progress has been made on the new diesel project. A second hand two cylinder diesel engine, rated at around 16 h.p, has been purchased. It appears to have had little use and starts very easily on our test rig. • The rebuilding of the clubs Maid of Kent has progressed to the extent we now have a chassis that runs on air. August 2011. • Work on the Wren loco is progressing with the frames and most of the other parts shot blasted, primed, undercoated, and given their final colour coat. • There has been no progress on the proposed new diesel loco. • The rebuilding of the clubs Maid of Kent is progressing. We are not sure if there is a design fault with this loco as the leading pair of driving wheels is lifted clear of the track. 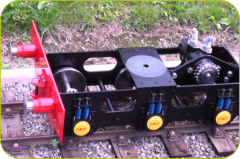 We are addressing this problem by reducing the diameter of the bogie wheels by 1/8” March 2011. 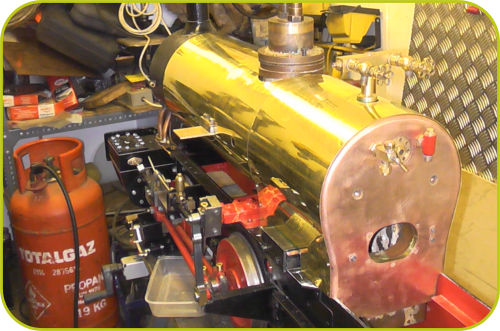 • The Wren loco has now been stripped down ready for refurbishment and installation of the new copper boiler. The old steel boiler failed its hydraulic test recently due to porous firebox crown so its replacement is now a pressing need. • There has been no progress on the proposed new diesel loco. • The seats of our multi-gauge (raised) track coaches have been re-covered with a blue leatherette material and a thicker, better quality foam. • Rebuilding of Maid of Kent has slowed down due to other priorities. The wheels have been quartered, the coupling rods rebushed and the pistons thinned to ensure the necessary clearance in the cylinder block. December 2010 • Construction of the new Wren copper boiler is in abeyance pending clarification of EU rules. • The special coach for carrying invalid chairs is just about complete except for the painting. • Ideas on the design of the new diesel loco have been discussed. This is for diesel engine driving either a hydraulic pump or electrical generator. The loco will be of the double bogie type, probable with a Co-Co wheel arrangement. 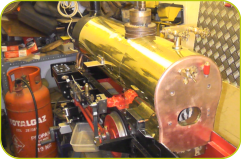 • Work on the Maid of Kent continues, the cylinders having been refurbished and the wheels and connecting rods reworked. A new axle and crank axle have been made and the wheels are now ready for quartering. Previously new axle boxes had been made and the frames improved and painted. .